This report documents the growth in older workers’ unstable and low-wage jobs from 2005 to 2015. By 2015, nearly 25% of older workers were in bad jobs. Bad jobs include the alternative work arrangements of on-call, temp/contract, and gig jobs (excluding independent contractors) and low-wage traditional jobs (paying less than $15,000 per year). The share of workers ages 62 and over in bad jobs grew from 14% in 2005 to 24% in 2015. Older workers in bad alternative work arrangement (AWA) jobs (on-call, temp/contract agency jobs, and gig jobs) are more likely to have lost their previous job involuntarily (17% vs 5% for older workers in other jobs). Older workers in bad AWA jobs view themselves as less employable than other workers, believing they have a 21% chance of finding an equally good job if they lose their current job vs an average of 36% for workers in other jobs. The share of older workers in alternative work arrangements (AWAs) is growing relative to the share in “traditional” jobs. Most of the growth in AWAs comes from jobs with unstable employment and low pay. The share of older workers in on-call jobs, temp/contract agency jobs, and gig jobs grew by 5 percentage points. The share in independent contract jobs, the highest paying form of alternative work, increased 3 percentage points. Between 2005 and 2015, the share of older workers in low-paying traditional jobs paying less than two thirds the median wage ($15,000 a year in 2015) grew by 5 percentage points to 15%, or 2.4 million older workers. Meanwhile, the share of workers in traditional jobs that paid above $15,000 declined by 13 percentage points to 59%. 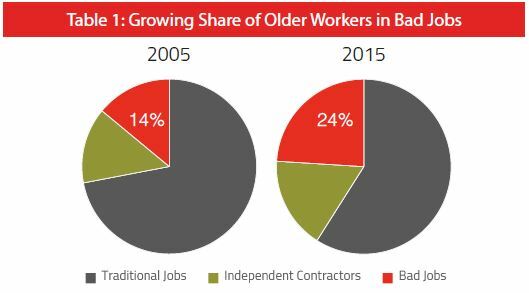 The combined increases in low-paying traditional jobs and unstable AWAs contributed to an increase in the share of older workers in bad jobs from 14 percent in 2005 to 24 percent in 2015. Workers in on-call, temp/contract agency, and gig jobs are more likely than average to have lost their previous job involuntarily and have low tenure in their current jobs. Their median earnings are $14,000. Many older workers in alternative work jobs take on these jobs as a last resort after losing their “career jobs.” They cannot afford to retire, but also cannot find traditional work in their industry, and view their job prospects as dimmer than most. Workers in low-paid traditional jobs have been in their current jobs for longer than those in unstable AWAs while they also face greater deprivation, with 12% reporting having faced food insecurity in the last year. These workers appear stuck in their precarious situations, with little prospects of moving into higher paying work. Providing older workers a reliable retirement savings account, such as Guaranteed Retirement Accounts (GRAs), would do more to enhance older workers’ retirement prospects and increase workers’ bargaining power than compelling workers to take on precarious jobs. GRAs are individual savings accounts that all workers can contribute to, with employers matching contributions and the government providing a guarantee of principal. GRAs provide a safe, effective vehicle for workers to accumulate personal retirement savings over their working lives.